The industrially prefabricated implant connection of the Raw-Abutment® titanium abutment blanks guarantees highest precision and fitting accuracy. The special milling strategies and milling bodies ensure a particularly smooth surface structure. Depending on the implant system, different Raw-Abutment® blanks are required. Their range is continually being extended. Thanks to the easily installable Raw-Abutment® Holder, the titanium abutment blanks Raw-Abutment® can now also be processed with the Milling Units M1 Wet Heavy Metal and M5 Heavy. 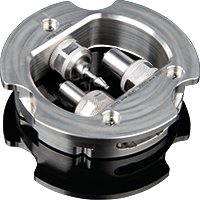 Hence it is now also possible to create individual and extremely precise-fitting abutments of ASTM tested biocompatible TITAN 5 with your own CAD/CAM device, in only 20 minutes. Due to the production in your own laboratory, you not only expand the service spectrum of your CAD/CAM device - leading to enormous time savings and an increased added value of your laboratory - but you can also even better guarantee the quality of your products, having actively participated in the production process. With the Titanium Spectral-Colouring Anodizer the Raw-Abutment® can be anodised in the desired colour (e.g. golden) and therefore don't shine through even under zirconia abutments. This leads to even more natural and individually aesthetical restorations.